Although many of the exact details of Jesus' life have been lost to history, most scholars would probably agree that he was not born in Waterbury, Conn. 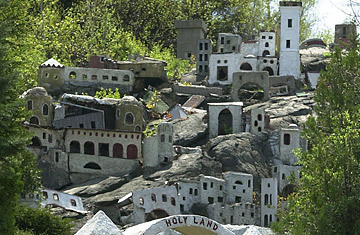 But you wouldn't know that by looking at Holy Land USA, a long-shuttered, Bible-themed amusement park containing a modest replica of Bethlehem. The park, which opened in the 1950s and closed in the 1980s, is now decrepit and overgrown, its buildings graffitied and falling down. It's officially closed to visitors, but it won't take a miracle to get past its unexceptional fencing.